Can psoriasis be treated without using Methotrexate (immunosuppressant)? Methotrexate is an immunosuppressive drug, which is used for treating Cancer, Crohn’s disease, Rheumatoid arthritis, etc. After administration of Methotrexate; the disease may disappear for some time only to return after some time. 1. Relapse: It is seen that by administering Methotrexate in psoriasis, patient experiences a quick relief symptomatically but after some time of using the drug the disease is likely to worsen more than before. Not only that, but it tends to become more difficult to treat once psoriasis returns. This is one of the biggest challenges with the use of Methotrexate. 2. Dependency: It is also found from number of studies that once the patient is put on Methotrexate, he feels good symptomatically but he has to keep on consuming the drug and his doctor has to keep on increasing the dosage of the drug. Thus patient becomes dependent on the drug. 3. Makes the treatment difficult: When a patient of psoriasis who is put on Methotrexate for a long time comes to a homeopath for homeopathic treatment, even homeopathic medicines take a long time to act on disease. In some such cases of prolonged use of methotrexate in the past, homeopathy may not help at all due to severely compromised state of the immune system. So, now, the question is, can psoriasis be treated without Methotrexate? The answer is not easy ‘yes’. It is yes and no, both. Yes, if psoriasis is treated in the early stage or even in later stage if there is no previous use of Methotrexate. As it has been found that Methotrexate makes psoriasis more difficult to treat, when it returns, even homeopathic medicines are not quickly effective for such a resurfaced psoriasis. Also, long term administration of drugs such as Methotrexate has many adverse effects like inflammation of mouth and tongue, nausea, vomiting, loss of appetite, bleeding from intestines, inflammation of outer layer of heart, headaches, drowsiness, convulsions and many more. The immunosuppressant just suppresses psoriasis for some time and patients may feel better. But after some time the relapse of the disease occurs and the disease becomes more and more obstinate to treat. At Life Force, Dr Rajesh Shah, MD, has treated over 3000 of cases of psoriasis over a span of 30 years, from across the globe. He has achieved high success rate of treating psoriatic patients using homeopathic medicines. He firmly believes that, homeopathic medicine given to the patient after detailed case history, detailed case analysis, after understanding the mental and emotional state of the mind of the patient brings a long lasting recovery from psoriasis. How do the homeopathic medicines work? Psoriasis is an immunological disease that means that the exact mechanism behind development of this disease is not known. Homeopathic medicines work by addressing the immune system in such a way that there is an immuno-correction leading to healing of psoriatic disease process and by trying to correct and treat the genetic tendency. Homeopathic medicines work by boosting up the immunity of the patient and thus homeopathy treats the patient from within. With homeopathic treatment there is no fear of any side effects. So, in other words, treatment of psoriasis is definitely possible without using immunosuppressant or Methotrexate and a complete recovery is possible by using homeopathic medicines, especially if methotrexate is not used much. 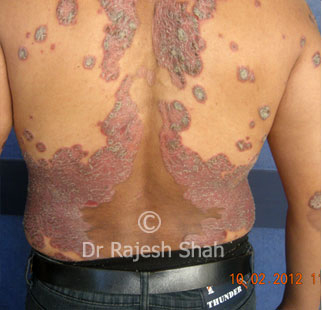 I was suffering from Psoriasis since 2008 for which I was using Tacrolimus ointment since 5 years. I started my treatment with Dr. Shah which was troublesome initially for 2 months but after that everything started getting better. His treatment proved to be useful and effective. I am totally satisfied with Dr. Shah’s treatment.